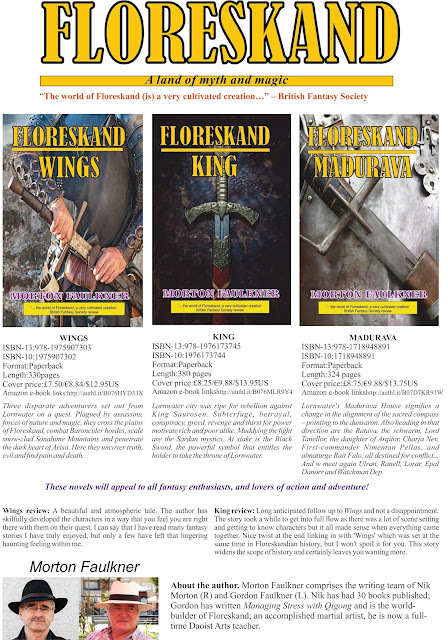 Just out this month, third in the ongoing fantasy series FLORESKAND. This one is titled MADURAVA. Here’s a paying market for writers of mysteries: Mystery Weekly Magazine. The magazine is a labour of love for the husband and wife team of Publisher Charles F. Carter and Editor Kerry. 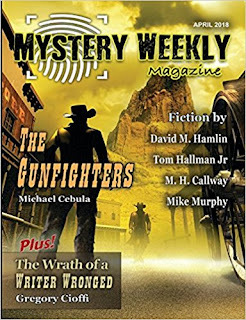 The magazine website is http://www.mysteryweekly.com/ You can download a copy to your Kindle or get the paperback version from Amazon. You can submit stories via email. ‘The Carters read submissions all year long, making detailed notes for writers who request feedback. 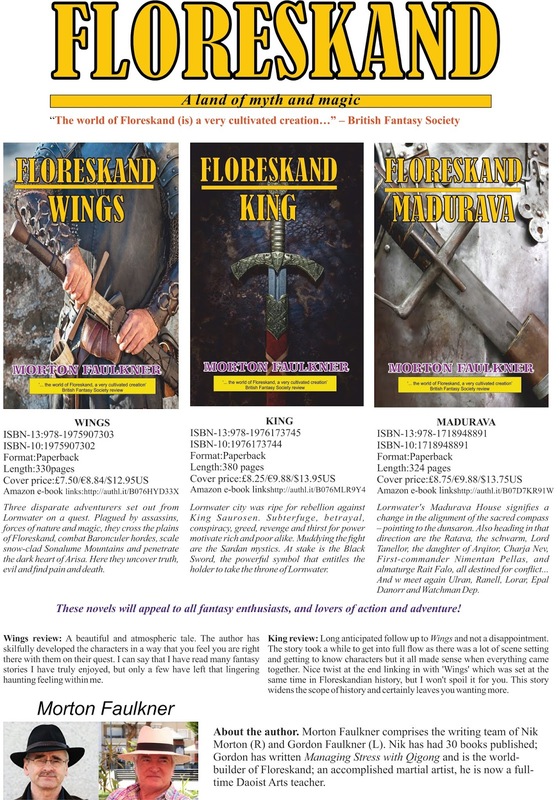 They promote their authors widely, publishing excerpts and links to Mystery Weekly’s stories via email, the journal’s website, and social media. ‘One such author is writer and illustrator Nik Morton, whose story “The Very First Detective: The Killing Stone” will be published in the magazine’s Sherlock Holmes special issue, October 2018. "When I picked up this novel about psychic British spy, Tana Standish, and her adventures in 1970s Czechoslovakia, the spy template I thought it would adhere to is the James Bond one. After all, that is already an outsized world and surely a beautiful spy with precognitive abilities could be dropped in fairly seamlessly. But Nik Morton actually foxed me, by instead opting for the John Le Carré model. This is a gritty and realistic feeling world, with dirt under its fingernails. And it’s beautifully realised. You can almost smell the Turkish coffee and cheap cigarettes in the cafes... But is there any way to make a psychic spy fit seamlessly into this world? You have your doubts, don’t you? And yet Morton manages it. Such is the level of detail and ambition, that Morton soon sweeps the reader up in the narrative and creates such a convincing canvas that we can easily accept the central conceit. Bouncing between different times and locations, he has created a book which feels big in scope, an adventure story with a supernaturally gifted protagonist that still feels absolutely real. I was expecting a light throwaway read with Mission: Prague, but was glad I got something far more ambitious." Thank you, F.R. Jameson for commenting on Goodreads. The full review can be read there. There follows a small scene from CHILL OF THE SHADOW. An exorcism. The church clock chimed eleven, each tolling of the hour resonating in the room. “Oh, God, it’s time?” Father Joseph said. Father Joseph nodded, his holy stole draped round his neck. The Bible in one hand, he recited the Credo aloud three times. He carried around the room a censer containing a small amount of the burning Frankincense. Maria’s eyes suddenly opened wide, staring, alarmed. But Michael didn’t recognize Maria in them. “Now, Father, the water,” Michael said, his tone firm and commanding. The response was immediate and startling. Maria’s body arched up from the bedsprings, and her flesh started to bead with a sickly green sweat. “Stand firm, Father,” Michael commanded as an eldritch shriek erupted from Maria’s mouth. Then she slumped down, the bedsprings rattling, and was still again. Father Joseph nodded and swallowed. Steeling himself, he stepped forward again. This time he was too quick, accidentally splashing Michael’s outstretched hand in the process. Three globules of water settled for a moment on the back of his hand, and then sizzled. Unconcerned, Michael shook the liquid off his hand; blisters, as if from an acid burn, appeared. “My God, what manner of man are you?” Father Joseph said, almost dropping the jug of holy water. “Stand back, it’s my turn,” Michael ordered, lighting the Paschal candle. There was a disconcerting flash of yellow and suddenly Maria was surrounded by a blazing transparent flame. It lasted for mere seconds and her body levitated this time, prevented from rising more than twelve inches by the ropes. Maria shrieked horribly, and out of her mouth leapt a gout of thick bile, speckled with green and yellow and red. In its gross suddenness it resembled projectile vomit, but it was unlike it in colour, consistency and smell. As the vile streamer left Maria’s mouth, Father Joseph leapt forward and thrust the crucifix he was holding over her mouth and held it there, while his eyes followed the terrifying manifestation across the room. Defying gravity, the sliver of bile appeared sentient, moving toward the balcony door; it baulked inches from the array of crosses; it tried the window and door, and retreated. Wherever it travelled, it left a putrefying stench in its wake. “Unbind the curse!” Father Joseph cried out and prayed again, louder, bellowing, commanding the evil spirit to leave in the name of the Blessed Virgin and the Holy Trinity. The horrible thing made a beeline for Michael, as if divining that he carried no protective cross. In one swift motion Zondadari’s fingers hooked up the censer and swung it, catching the thing as if he were playing pelota. As the evil spirit sizzled and emitted a stomach-churning smell, Father Joseph left Maria’s side and poured the remainder of the holy water onto the mixture of cooking bile and Frankincense. The steam quickly dissipated, to leave a burned, brittle husk. “And what the hell do you think you’re doing?” shrieked Maria from the bed, trying to tug her arms and legs free. Other news concerns the rumbling in Europe caused by the ascension of Herr Hitler. Widmerpool has a leaning towards the ‘socialist’ political spectrum. ‘People talk of rearming. I am glad to say the Labour Party is against it to a man – and the more enlightened Tories, too.’ (p66) This is another one of those lengthy speeches Powell’s characters indulge in. ‘What is much more likely to be productive is to settle things round a table…’ (p67) So, while the bohemians and businessmen enjoy their chatter over cocktails, all of Europe sleepwalks towards a world war. Later, mention is made of the embargo on arms to Bolivia and Paraguay, the ‘Smash Fascism’ group, the worries about Mosley, and the independence of Catalonia, and free meals for schoolchildren. (p120) And, briefly touched on, the conflict between Japan and China (p203). While there are no great laughs, despite this being described as a humorous novel, there are moments that raise a smile. One of these is Erridge’s butler, Smith. An alcoholic who imbibed from the cellar, he was shaken when asked if there were any champagne in the cellar. 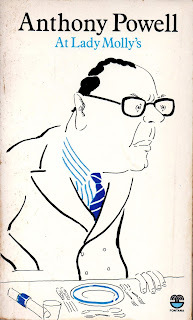 Smith’s face puckered, as if manfully attempting to force his mind to grapple with a mathematical or philosophical problem of extraordinary complexity. His hearing suggested that he had certainly before heard the word “champagne” used, if only in some distant, outlandish context; that dvotion to his master alone gave him some apprehension of what this question – these ravings, almost – might mean… After a long pause, he at last shook his head. Nick’s friend Stringham seems dominated in some manner by Miss Weedon, Tuffy, who may have designs on curing Stringham of his affection for alcohol. Nick ‘found her a trifle alarming. She gave an impression of complete singleness of purpose: the impression of a person who could make herself very disagreeable if thwarted.’ (p163) We shall see more of her in volume 5. If I’d been reading these books when they were first published, I may well have lost the thread and interest, waiting a year or more between each ‘episode’. Being able to read them in close proximity (even if interspersed with other books), the characters do tend to live – even if essentially uneventful lives. 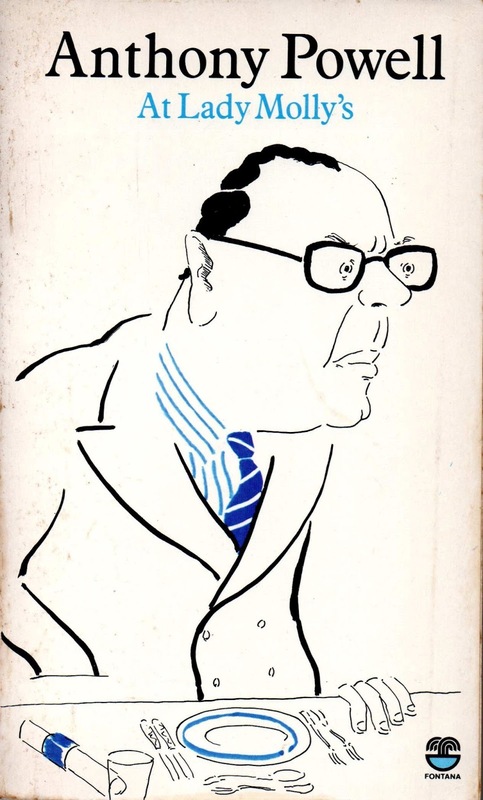 The cover depicts Kenneth Widmerpool by Mark Butcher; a fleeting resemblance to Reginald Maudling (1917-1979), British politician. Next: 5 - Casanova’s Chinese Restaurant. Still huge unbroken paragraphs, also in speech, which is totally unrealistic. Again, there’s not a great deal of description of the scenes that contain the characters, the reader can’t actually ‘be there’. As observed above, Powell’s character descriptions are a delight.